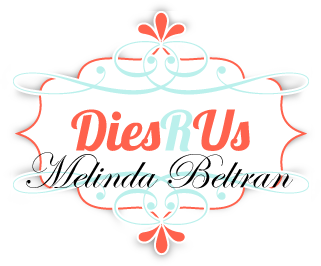 I am so excited and thrilled to share our giveaway sponsor this week! They are giving away a pen set and pen holder to one lucky blog follower this week! These pens work in your Cricut and also in your Pazzles Inspiration Machines! I have to tell you, I am so in love with this whole print and cut concept. It's like being able to create digi stamps with your cutting files and then cutting them out! There are several different sets to choose from with SWIRL ones available too. Let me just say, Like most of you, I have had my share of gel, glitter pens over the years. I was pretty skeptical about these. I thought they wouldn't draw smoothly, would skip or would just be plain dried up and out! But after playing with these, I have been very pleasantly surprised! They draw so smooth and with the little magnets on the ends, they pop right into place in their custom holder. You must be a follower of this blog....thanks so much! You need to leave a comment on any post from today through Sunday, Augus8th, 2010. That's it! I will be posting everyday this week, so that will give you up to 7 chances to enter to win! One random winner will be selected from among the posts! As a special bonus, if you order from them and use the coupon code: GETCOOKING, I will personally send you 5 special "draw and cut" designs I have made especially for this! I will post pictures of the 5 special designs in a couple of days! OKAY Now for my first project! Okay, I made two things. I made a card and a tag. Here is a closeup of the card. 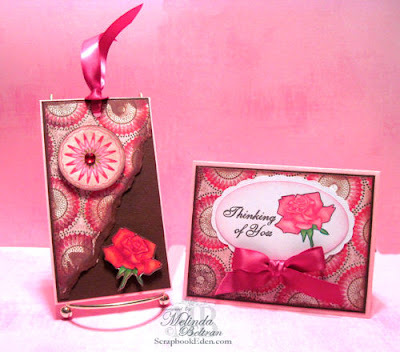 I designed the rose and then added the wording and the oval and oval scalloped shape. I used the Glitter gel pens to "draw the rose and the sentiment. I then cut it out with my cutter and then cut a matching scallop oval to layer behind the draw and cut. Worked like a charm! 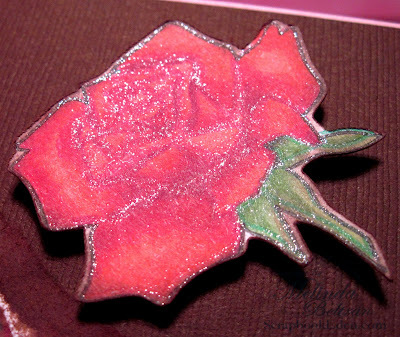 Here is a close up angled view to show how the glitter shimmers through even after coloring the rose in with my Copics. Here's a closer view of the tag. 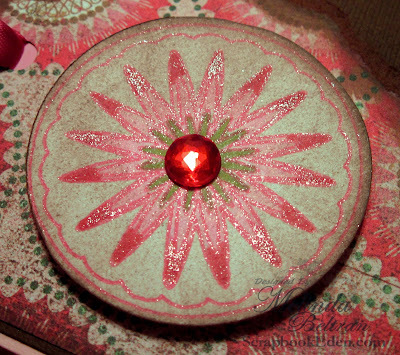 Here is a closeup of the Star "Medallion" I made. I drew it with my pink glitter gel pen and then cut it out with my cutter. I colored it in with my Copics and then hit the whole thing with my Chestnut Roan Chalk Ink. 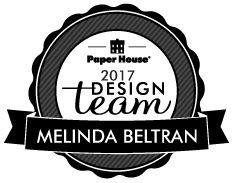 I was inspired for the design by the pretty Basic Grey Patterned Paper I used. 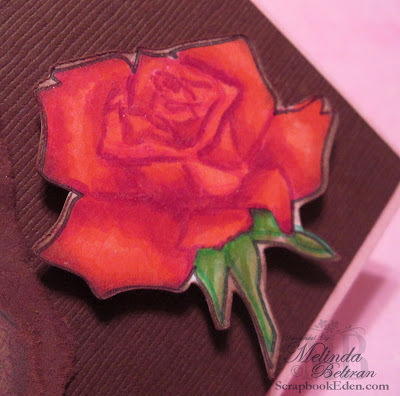 Here is a closeup of the rose that I "drew and then cut". I used the glitter gel pens as you can see by the angle of this photo. You could set your "cut" lines even closer to the object so that no white shows. It was very accurate. Here is a different angle of the same rose. You just don't see the shimmer from this angle. So be sure to leave a comment on each post this week and become a follower to win! So where are the FREE Draw and Cut Files?!!! BTW, These files are available in: WPC, KNK, GSD & SVG! This included the FREE Draw and Cut Rose File, Thinking of You Sentiment and Matching Scalloped Oval. Your cards are amazing as always. I love the glitter on them. Love your rose. Your projects are always so beautiful and a work of art. Gorgeous, simply gorgeous, this is why I am a follower, your creativity gives great inspirations!!!! The medallion looks like it came right from the paper! I love it and the rose is so beautiful love the way the sparkle shines through! The card and tag are beautiful! This seems like a cool product. I look forward to seeing more. OMG Melin this is gorgeous, love all that glitter. So what font did you used for that gorgeous sentiment? It just writes so well w/ the pens! I love,love,love this card. I thank you so much for your time and talents that you share with us. Beautiful card and tag. Heard about the gel pens for the Cricut but never saw anything using them. Still haven't gotten my brain wrapped around how they work. Similar to the Cricut markers? Did you do a different "cut" each time you changed pens? Your work is always so beautiful! Beautiful card! I would LOVE to win a holder and pens! Absolutely gorgeous! I would love to try these! Oh WOW! So very wonderful. My cricut would love to meet new friends to play with. 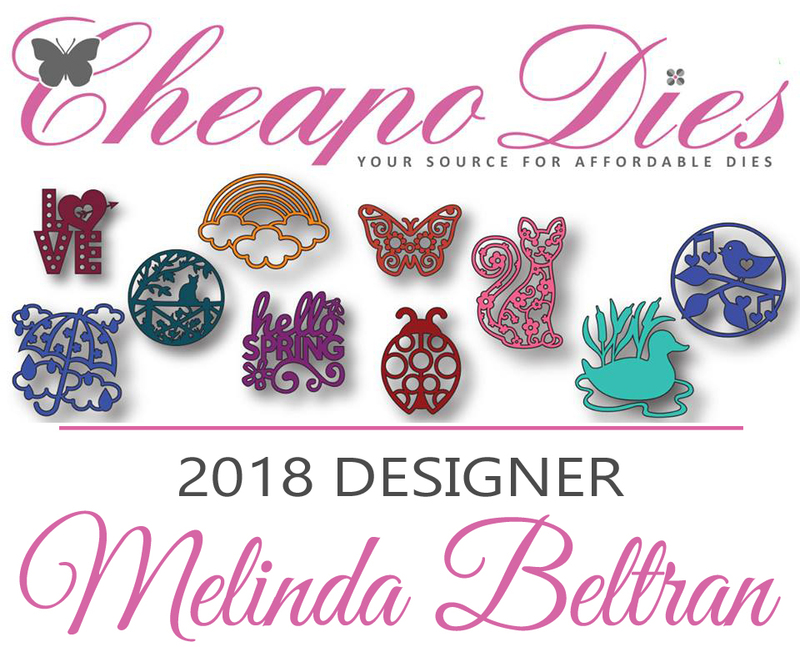 I would love to introduce these to my cricut! tytyty for the chance. This is decinately a wow card! I love all the glitter on the rose. It shows up beautifully. Thanks for the cut files and thanks for the chance to win these awesome pens. I want them! Right up my street! I can't seem to make cards WITHOUT bling and glimmer and glitz!! I'm definitely off to try this out. The possibilities are endless! And you make it (sound) sooooooooooo easy:-) Thanks for the files! I love the distressing and the torn paper! The glitter is a nice touch, also. Great work! Gorgeous examples, especially your rose. Thanks for the chance to win these pens! Absolutely beautiful. What a great job! Love the rose and medallion. Thanks for the inspiration. Gorgeous projects!! I would love a chance to win these awesome pens! Thanks! Love your projects! And awesome giveaway! I keep seeing wonderful projects with these pens and I would love to try them out! Thank you for the chance to win! Great designs. I still haven't tried gel pens in my Cricut. Winning would make that easy! Thanks. this card is awesome!! I would love to try these pens, so keeping my fingers crossed!! 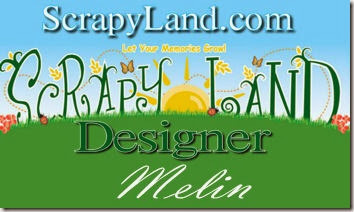 Just discovered your site...beautiful work!! I've been skeptical about trying these gel pens, but you've changed my mind! I love your cards, thanks for sharing them with us. I am loving these pens!! I think they would make a great addition to my stash ;-) ! Thanks for offering this giveaway! WOW! Fabulous card and these look like wonderful pens! Thanks for offering this giveaway! I'd love to win! Beautiful Example of using your cricut as a multitasker! At the moment, I use mini gel pens and a rubber pen grip, and though it works, it isn't as smooth as the cri-kit pens are. I love the look you created! These are really pretty - I have wanted to try these out so thank you for the opportunity to win them! ABSOLUTELY GORGEOUS!!!!! I have their pens and holder too and LOVE LOVE LOVE them...I think they are the BEST on the market!!!!! Hands down!! wow...i just bought a cricut expressions and i thought i loved it, but i suppose that i really don't know all its capabilities yet. these pens are the exact reason why i'm still hanging onto it...i am happy to join this site with the hopes i will learn how to navigate my way through this. thank you for the opportunity to win the pens. Amazing cards and love the glitter! I would love to win some pens to use with my cricut! Thanks for all your great projects. You are truly an inspiration to me!! Thanks for the chance to win!! I absolutely LOVE your BLOG. You are so very creative and generouos to share your ideas with us. 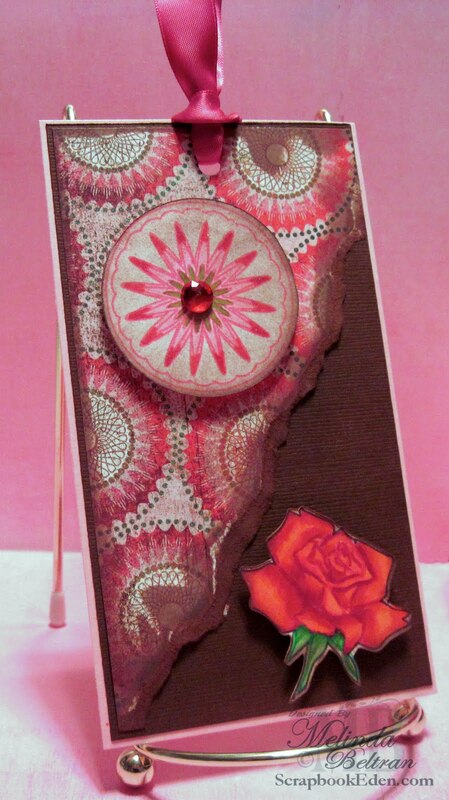 Love your card and bookmark they are just beautiful. Thanks for sharing and the chance at winning the gel pens. Your card and tag are just beautiful. The card and tag are absolutely BEAUTIFUL. I got some of those pens for my daughter and she hasn't used them yet. Guess I need to light a fire under her. This would be so great to win. I have been wanting to try these pens but don't have any yet. Your card and tag are very pretty. Your cards are beautiful. I have wanted to try these pens but right now it's not in the budget. TYFS & the chance to win these. I would love to try them, but am a little skeptic to spend the money. Winning would be terrific!! As always your work is beautiful. Wouldn't mind seeing a tut on how you achieved this effect -- I'm visual so to see it as you explain works best for me. Of course "winning" the pens so I can put into practice what I've learned would be the icing on the cake. Thanks for sharing. Your card and tag are absolutely beautiful. I love the colors and paper that you used. I had tried previously to become a follower on your site but it just wouldn't work. I finally made it today! Thanks for the chance to win those Cri-Kit gel pens. Love your card and tag, thank you for sharing. And thank you for the opportunity to win the CriKit gel pens. Your cards are just so beautiful and thank you for sharing your wonderful talent with us! 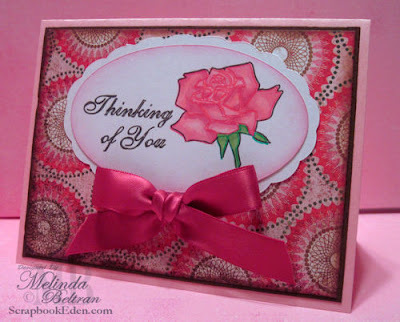 This is just such a beautiful card and tag! I love the glitter effects on it. Thank you for once again sharing your talent and files and the opportunity to maybe win a CriKit set.. Your work is so inspiring. I have learned more from visiting your site than I ever did on the Pazzle site. 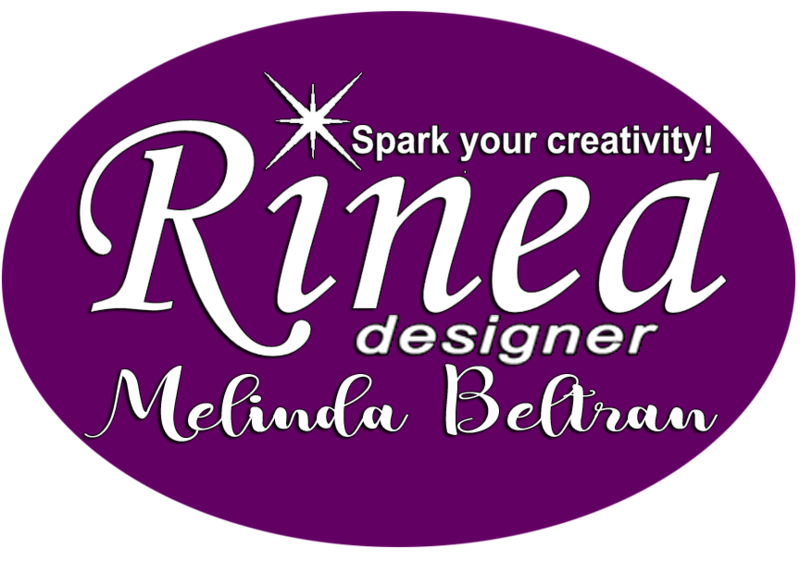 I have a new lease on creativity and I love your new card. What a lovely card. Thanks for the chance to win the pens. Wow, lovely projects!! You are so creative and now I HAVE to have these pens!!! Thanks for a chance to win! Beautiful work! Thank you for the chance to win the cri-kits pens! Love your work. The cards are just gorgeous. I'm a follower and this card is gorgeous. I love the colors you have chosen. Would love to win the pens. Really cute, you always have such cute files. going to look at the gel pens now. Thank you for the information and for sharing your creatvity. Great cards! Thanks for the free cut n draw files!! I am enamored of the medallion! I so want these pens. I tried using the markers with my elementary students working on States projects and it was just not satisfactory. I think these would work ever so much better! I love your cards! They truly rival any that I have seen on the commercial market, so much better!! I would love to have a set of pens to detail my work too! 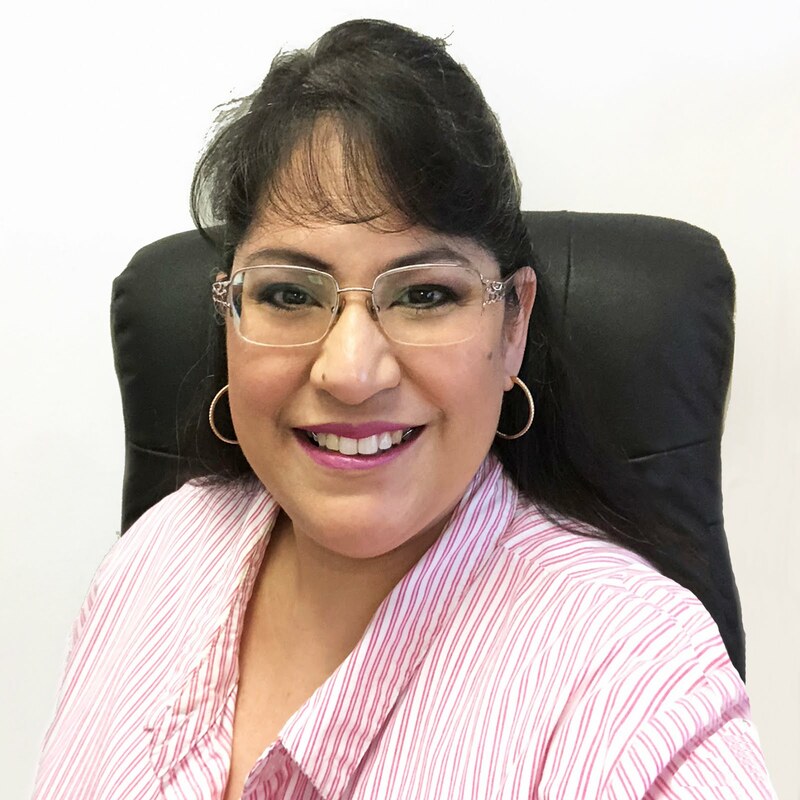 Thank you for sharing the medallion, rose and text files and also the chance to witn the Crikit set. Your card and tag is awesome. Looks like I didn't complete my comment so will start over. I mentioned your awesome talent and thanked you for the chance to win your give-away. I see I have my work cut out for me once the boys go back to school. Great projects. Thanks so much for sharing. I usually get your posts through a group I am on. I am now a follower. Would love to win these pens. These pens are awesome. I love the way the images glitter. Beautiful work! Thanks so much for opportunity to win a set! Your work is amazing and inspirational! I love these new pens! They would have been a terrific asset to have for a tag project I had. I always look forward to your posts! You are one talented lady! I love your work it truly is inspirational. WOW! That card is BEAUTIFUL!!! wow, these are really beautiful. Love the glitter look alot. really need to get these pens. These pens look awesome!!! I cannot wait to see the fabulous profects you do with them!!! I just spent two hours on your webpage and have only scratched the surface! Thank you for your generosity of time and talent. Wow wow wow what a lovely card and effect, I cannot believe how much glitter shine you get from these pens. Thanks for the chance to join in, I am already a follower. Very lovely! I'm liking these pens!!! Hope I win! Just beautiful... that rose is to die for. How beautiful! Love the rose. Just beautiful, and I would love to see a tutorial on this technique if you could share. I love the rose and medallion card. Absolutely lovely. Thank you for so generously sharing your ideas and files! 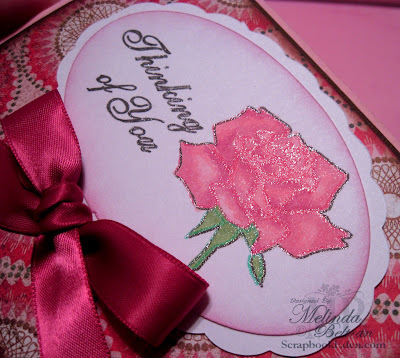 Your card and tag are stunningly beautiful! OMG - I just love your work, You do an amazing job. Very creative. Makes me want to make some cards. Thanks for sharing all your awesome projects. I would love to win the pens so I can make one of these projects. Love the card, such a great job and the glitter pens just add the final touch! Lovely - I haven't tried drawing on the pazzles (or cricut) yet so hope to give it a try soon.